Ahaaa ha ha-ah ha ha. Ha haaa ah ha! Ha ha haha ha. Ahem. So, you know, my evil laugh has come a long way now that I’ve made it into the Evil League of Evil, as you can probably hear. I mean, you can’t actually hear it, since I can’t record it. But from the uh, transcription up there you should be able to imagine just how horrible it’s become. And before people start sending emails saying that I’m just trying to hide my laugh, for whatever reason, let’s be clear: I can’t record it because Moist broke my webcam, not because I’m ashamed of the laugh or because it isn’t horrible. Because it most definitely is horrible. Horrifyingly… horrible. You’ll just have to trust me here. SO I know it’s been a long time since my last video blog (4 years? ), and I know I haven’t been able to respond to my fanmail either. But now, the wait is over. 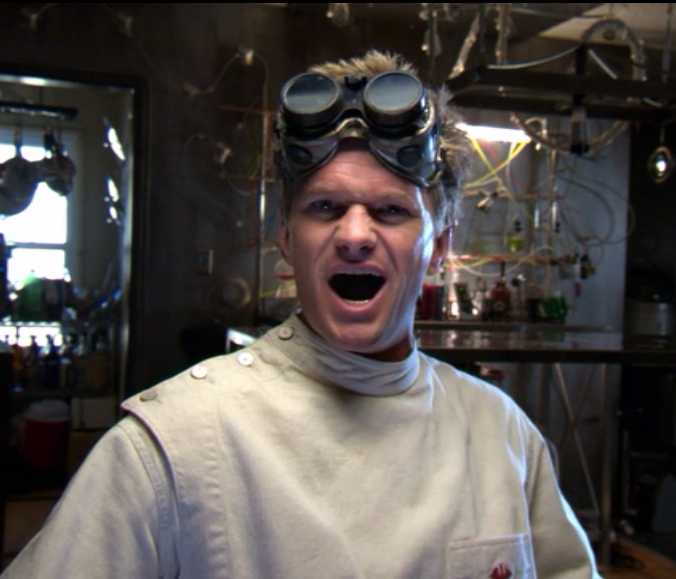 Dr. Horrible is back. Tell you friends. Anyway, ever since my famously successful victory over Captain Hammer, I’ve been working hard on a new scheme. Remember the freeze-ray? The one that stops time? With the Evil Genius grant I got from the league, I was able to steal enough Fluffletonium to bring it up to a whole new level. So now it doesn’t just stop time. Now it can change time too – rewind, fast-forward, everything. Which is big. Really big. Figuratively. That was maybe a year ago. Since then I’ve had to figure out what to do with it. Which, you know, is a lot harder than it sounds. I have a public image now, so, uh, just committing whatever crime I choose doesn’t work anymore. I’ve got to stick to a theme. Which in my case is an evil inventor theme. But I finally did come up with something, a plan that is, and it’s got everything: mayhem, vast sums of money, destroying the status quo… that evil inventor theme, the one I mentioned earlier…. This is it, boys and girls. This is the one to be excited about. Brace yourselves. I’m going to become the world’s greatest, most evil inventor, by stealing all the royalties and rights from every major inventor that has ever lived. And I’m going to do it by going back in time and patenting their own inventions before they had the chance. Thomas Edison, Alexander Graham Bell, Samuel Morse… all about to vanish from history. I will become the greatest inventor, ever. Next time you use your phone, or turn on a light bulb, or send someone a, uh, telegraph… you’ll have to pay. Just make those checks out to Dr. Horrible, P.H.D. So here goes. See you at the aftermath. Benjamin Franklin threw the liberty bell at my head. Not to worry though, I’m fine. Only the bell was damaged. Wow he was strong. RIGHT, anyway I was able to make off with most of his designs and discoveries. So there was that. The US patent office didn’t exist yet, but that’s not a problem for, you know, a time traveler. Benjamin Franklin never patented any of his inventions, so I thought it’d be easy to get the credit myself. Once I had the patent, anybody who was using a Franklin Stove would have to turn it in, and buy a replacement Horrible Stove from one of my licensed distributors. I admit the product name could use some work. "Your patent application for the 'Horrible Stove' has been denied..."
Except, turns out it doesn’t work that way. A statutory bar had been put in place to prevent copycats (or time travelers) from obtaining patents on inventions and discoveries already in use. SO… I’d just have to try patenting one of Ben’s less widely used inventions, right? Well, turns out that doesn’t work either. Even if nobody uses an invention, as long as publicly available information exists about it it’s not eligible for patent. Prior art, I think was the… uh, word. Term. Long story short, I came away empty handed. So my first attempt was not 100% successful. Per se. Let’s hope second time’s the charm. No success this time either. I, uh.. I tried to steal Thomas Edison’s patents. I thought the light bulb was a good one to start off with, since everybody uses them. Or did, before CFLs. And at first things went well. This time I checked the dates carefully, so I got to the patent office well ahead of Edison with my application. Annnnd it worked. Sort of. Until Edison contested the patent, claiming that his invention of the light bulb predated my own. I couldn’t believe it. I mean, Edison accusing someone else of stealing his invention? Irony, am I right? Anyway, the earlier filing date of my application, which, you know, was the factor I had been counting on, only gave me a slight advantage. Apparently, all Edison needed to do to steal the patent back was to prove that he had come up with the idea before I had. Alas, I’m not so easily beaten. Edison should have known that I would fight back. And prevail. Because I have a P.H.D. in horribleness. Plus, I've got a hand-cannon. Quickly, I jumped back forty years and created private documentation proving that I had first conceived of the lightbulb decades before Edison. Ha! 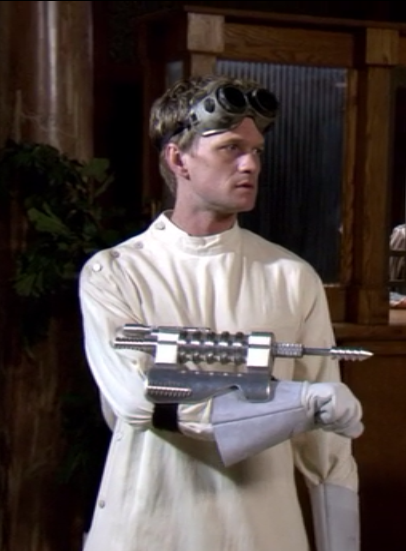 Dr. Horrible 1, Edison 0. ….At least those should have been the scores. Once again, it turns out that the people who make laws have taken precautions against time-travelers. I think it was Benjamin Franklin who must have warned them. Anyway, earlier conception alone isn’t enough – I was told that I would also have to prove that during the time between my conception and Edison’s conception I had worked with “reasonable diligence,” whatever that means, in the preparation of my patent application. So I was stuck. I had supposedly conceived of the light bulb decades before Edison. And there was no way I could have worked diligently for FORTY YEARS on my application. I had to leave empty handed. Again. Good news! Right. So I’ve learned a lot from all this, and I’m going to use it. In just a few short hours I’ll be the most renowned and respected inventor you’ve never heard of. Why never? Because, boys and girls, I’m going to be famous in the future. 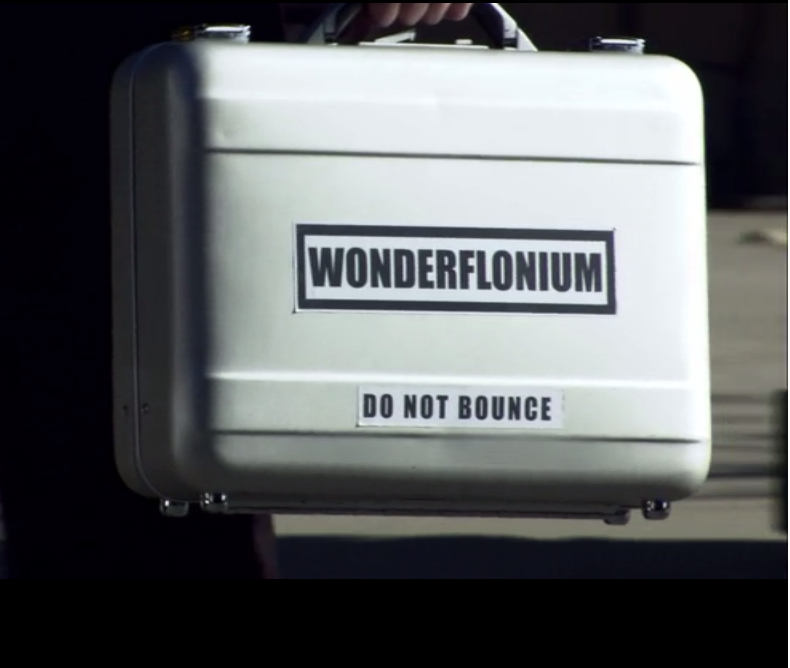 I’ve identified the most valuable invention of the 21st century: the element Wonderflonium, first created in July, 2015. 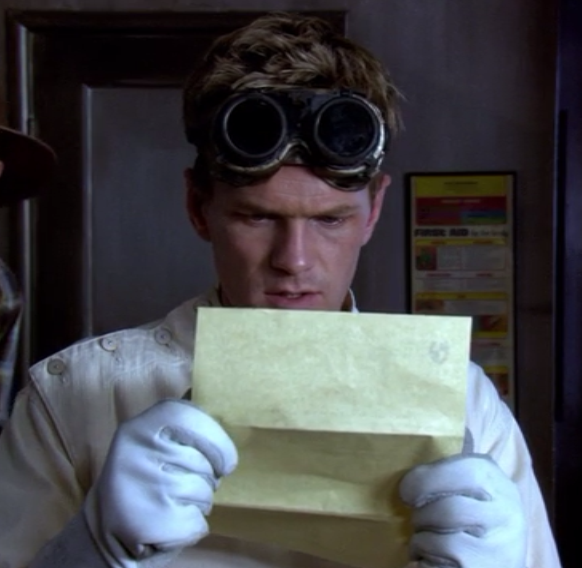 I’ve already planted evidence in 2015 proving that I, Dr. Horrible, invented this new element myself in June, and that I worked diligently on preparing my application between June and July of 2015. On the day after the real inventor files his patent, I’ll present my evidence and walk away with the patent. Easy. Like candy from a baby.